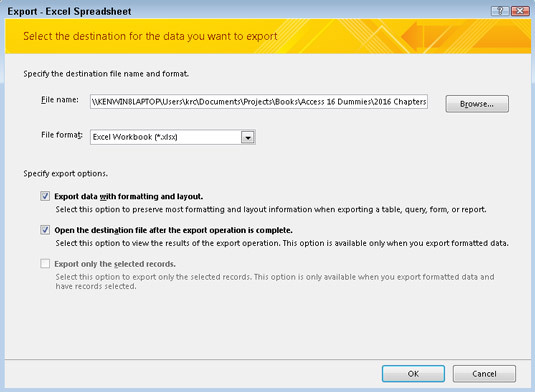 Every Access 2016 object can be exported; the most common export tasks are exporting data in a table or query to another program (such as a spreadsheet) and exporting a report as a Portable Document Format (commonly known as a PDF). Exporting a table or query involves reorganizing the data it contains into a different format. As with importing, Access can translate the data into a variety of file formats, depending on your needs. Because every Access object can be exported, the External Data tab on the Ribbon presents you with all the file formats in which the object can be exported. If you can’t export it to a certain format, that format’s button is disabled. Access exports to the same formats that it imports. Access also exports to PDF (Adobe Acrobat files), XPS (XML Paper Specification), Microsoft Word, and to an email attachment. With the database open, click the table or query that you want to export. All database objects are located in the Navigation pane. The table or query name is highlighted. Click the External Data tab on the Ribbon. The common exporting tasks have their own buttons. The seldom-used formats are lumped together; you can get at them with the More button. Click the button that matches the program to which you’ll export your data. 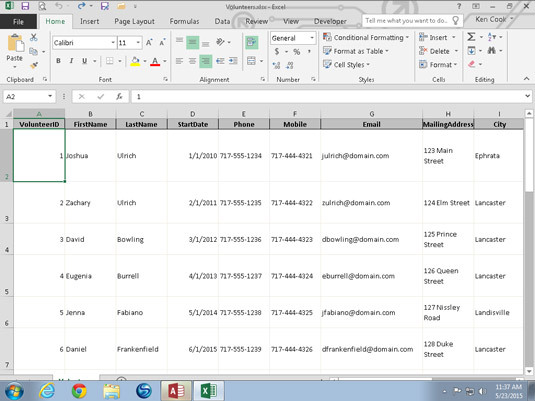 Step 1 of the Export – Excel Spreadsheet dialog box completed. An Export dialog box customized to your format of choice appears. Follow the steps in the Export dialog box to complete the export. Every choice asks for a filename (including path) for your exported data. Some export processes also ask whether you want to open your new file after the export is complete. This latter feature can prevent a frustrating search after you save the file. Select the Save Export Steps check box if you know you’ll do this export again. The check box is located on the last screen of the Export Wizard. After you check the box, you’ll be prompted for a name for your export. The exported Volunteers table in Excel, ready for anything. With the database open, click the report that you want to export. All database objects are located in the Navigation pane. The report name is highlighted. The Export button group appears on the Ribbon. Click the PDF or XPS button in the Export group. 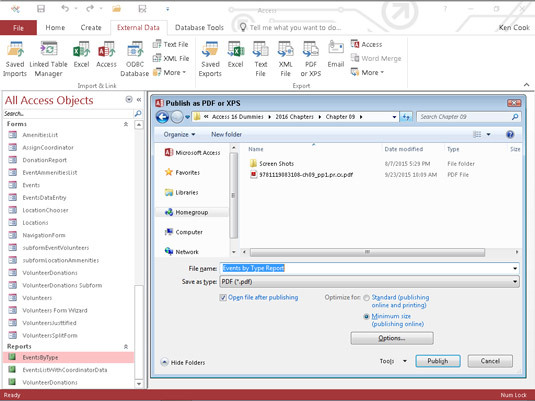 The Publish as PDF or XPS dialog box appears. Exporting the Events by Type report to PDF. Browse to the folder you’d like to store the file in and type a file name in the File name box. The report is saved as a PDF to the folder and with the file name you specified.